gDepartment of Radiology (Q.J. ), Taishan Medical University, Tai'an, China. BACKGROUND AND PURPOSE: Corticothalamic networks are considered core pathologic substrates for idiopathic generalized epilepsy; however, the predominant epileptogenic epicenters within these networks are still largely unknown. The current study aims to identify these epicenters by resting-state functional connectivity. MATERIALS AND METHODS: To identify epicenters within the corticothalamic networks in idiopathic generalized epilepsy, we retrospectively studied a large cohort of patients with this condition (n = 97) along with healthy controls (n = 123) by resting-state functional MR imaging. The thalamus was functionally divided into subregions corresponding to distinct cortical lobes for 5 parallel corticothalamic networks. 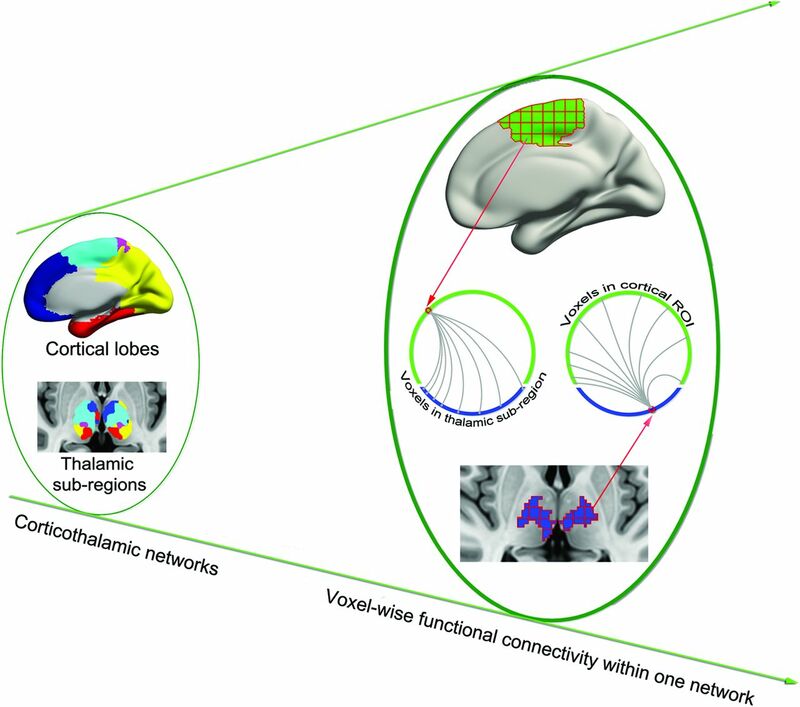 The functional connectivity between each voxel in the cortical lobe and the corresponding thalamic subregion was calculated, and functional connectivity strength was used to evaluate the interconnectivity of voxels in the cortex and thalamus. RESULTS: The projection of 5 cortical lobes to the thalamus is consistent with previous histologic findings in humans. Compared with controls, patients with idiopathic generalized epilepsy showed increased functional connectivity strength in 4 corticothalamic networks: 1) the supplementary motor area, pulvinar, and ventral anterior nucleus in the prefrontal-thalamic network; 2) the premotor cortex and ventrolateral nucleus in motor/premotor-thalamic networks; 3) the visual cortex, posterior default mode regions, and pulvinar in parietal/occipital-thalamic networks; and 4) the middle temporal gyrus in the temporal-thalamic network. CONCLUSIONS: Several key nodes were distinguished in 4 corticothalamic networks. The identification of these epicenters refines the corticothalamic network theory and provides insight into the pathophysiology of idiopathic generalized epilepsy. It was recently demonstrated that resting-state functional connectivity can reveal distinct corticothalamic networks13 analogous to classic histologic parcellation.10 As in previous investigations,14⇓–16 a similar approach was adopted here to identify corticothalamic networks. We hypothesized that the functional synchronization of corticothalamic networks is altered in patients with IGE. To localize epicenters within these networks, we conducted a voxelwise comparison of network functional connectivity between patients and controls. Patients were consecutively enrolled at Jinling Hospital, Nanjing, China. Patients were diagnosed according to International League Against Epilepsy criteria (2001). The inclusion criteria for patients were as follows: 1) manifestation of typical clinical symptoms of idiopathic generalized tonic-clonic seizures, including tonic extension of the limbs, followed by a clonic phase of rhythmic jerking of the extremities, loss of consciousness during seizures without precursory symptoms of partial epilepsy and aura; 2) no evidence of secondary generalized seizures, such as trauma, tumor, intracranial infection; 3) no abnormality on structural MR imaging; 4) presence of GSWDs on the video-electroencephalogram; and 5) right-handedness. Ninety-seven patients fulfilled these inclusion criteria. The exclusion criteria were as follows: 1) history of addictions or neurologic diseases other than epilepsy; 2) history of partial seizures; 3) self-reported falling asleep during resting-state fMRI scanning; and 4) head translation or rotation parameters exceeding ±1.5 mm or ±1.5°. After excluding 11 patients due to excessive head motion, we included 86 patients in the final dataset (Table 1). All 86 patients had generalized tonic-clonic seizures, and 17 had additional myoclonic jerks and absences. All 86 patients were taking antiepileptic drugs, including valproic acid, topiramate, lamotrigine, phenobarbitone, or some combination, and 34 had taken other medications, including carbamazepine, phenytoin, traditional Chinese herbal medicines, oxcarbazepine, or clonazepam. Healthy controls (n = 123) were recruited from the staff of Jinling Hospital. They had no history of neurologic disorders or psychiatric illnesses and no gross abnormalities in brain MRI. Written informed consent was obtained from all participants. The study was approved by the local medical ethics committee at Jinling Hospital. Data were acquired by using a Magnetom Trio (Siemens, Erlangen, Germany) MR imaging scanner at Jinling Hospital. Functional images were acquired during the interictal period. Scalp electroencephalograms were not recorded during scanning. All patients were assumed to be in the interictal state during scanning because there were no apparent seizure symptoms observed by video monitoring. Foam padding was used to minimize subject head motion. Functional images were acquired by using a single-shot, gradient-recalled echo-planar imaging sequence (TR = 2000 ms, TE = 30 ms, flip angle = 90°). Thirty transverse sections (FOV = 240 × 240 mm2, section thickness/intersection gap = 4 /0.4 mm) were acquired. A total of 250 volumes were acquired for each subject. Subjects were instructed to rest with their eyes closed, without thinking of anything in particular or falling asleep. After scanning, subjects were asked whether they had fallen asleep during the scan. Functional images were preprocessed by using the Data Processing Assistant for Resting-State fMRI (http://rfmri.org/DPARSF) and SPM8 software (http://www.fil.ion.ucl.ac.uk/spm/software/spm8) toolkits. Functional images were section-timing-corrected, then registered to correct for head motion during the scan. On the basis of the known impact of head motion, the frame-wise displacement was calculated for each time point.17 If the frame-wise displacement exceeded 0.5 mm, the value of the signal at that point was interpolated by using piecewise cubic Hermite. Functional images were normalized to the EPI template in Montreal Neurological Institute space and resampled to an isotropic 2-mm3 voxel. Next, linear trends were removed and temporal bandpass filtering (0.01–0.08 Hz) was performed. Finally, several sources of spurious variance were removed by regression of the following variables: 6 head-motion parameters, signals averaged over CSF, and white matter.13,14 As previously proposed,13 data were neither smoothed nor regressed out of the averaged global mean signal. Identification of Functional Corticothalamic Networks. Voxelwise Functional Connectivity in Corticothalamic Networks. Schematic of data analysis. 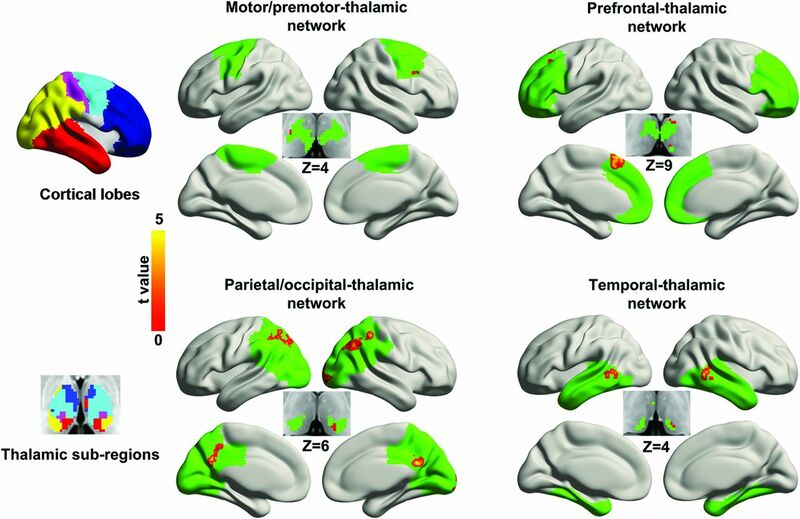 From the left to right planes, 5 corticothalamic networks were first identified; FCS was then calculated for each voxel within the corresponding corticothalamic network. For example, 1 voxel in the cortical lobe was correlated with all voxels in the corresponding thalamic subregion. All superthreshold coefficient values were averaged to obtain the FCS of the cortical voxel. FCS maps of 5 parallel corticothalamic networks were separately compared between groups by using the 2-sample t test. The corrected statistical threshold (P < .05) was accomplished by 2 steps: First, the comparison result was corrected (P < .01) by the AlphaSim program (http://afni.nimh.nih.gov/pub/dist/doc/program_help/AlphaSim.html) within each network (with a height threshold of P < .001 for all cortical and thalamic subregions, and extent thresholds for each cortical region and the corresponding thalamic subregion of >480 and 24 mm3 [prefrontal cortex and thalamus], 160 and 32 mm3 [motor/premotor and thalamus], 720 and 24 mm3 [parietal/occipital cortex and thalamus], and 480 and 24 mm3 [temporal cortex and thalamus]). This step was followed by a Bonferroni correction for the 5 corticothalamic network comparisons. The clinical variables (disease duration, seizure frequency, and onset age) were correlated with regions showing abnormal FCS. Spearman correlation analysis was used because none of the clinical variables showed a Gaussian distribution. In control subjects, each cortical lobe was connected to distinct, largely nonoverlapping parts of the thalamus (Fig 2), consistent with previous findings.13 Specifically, the prefrontal lobe showed maximal correlation with the mediodorsal and anterior nuclear areas; the motor/premotor cortex corresponded most strongly to the ventral anterior, lateral dorsal, and part of the medial nucleus; the somatosensory cortex corresponded to the ventral posterior nucleus; and the parietal/occipital and temporal cortices corresponded to the lateral and medial part of the pulvinar. Similar patterns were observed in patients. However, qualitative differences were observed between the groups. Compared with controls, the thalamic subregions connected to the prefrontal and motor/premotor cortices were expanded and shrunken, respectively, in patients. The changes may simply relate to the different sample sizes of each group, rather than pathologic alteration. Highly specific connections between the cortical lobe and thalamus. The 5 columns on the left show the cortical lobe and highly correlated thalamic regions in patients with IGE and healthy controls. In the winner-take-all map, each thalamic voxel is labeled according to the cortical lobe with the highest t value. The z plane coordinates indicate the Montreal Neurological Institute space. A between-group comparison indicated that FCS was increased in patients (Fig 3 and Table 2). In the prefrontal-thalamic network, the regions of increase were located in the left middle frontal gyrus, left supplementary motor area (SMA), left pulvinar, and left ventral anterior nucleus. The motor/premotor-thalamic network showed increased FCS in the right premotor cortex and right ventrolateral nucleus. The parietal/occipital-thalamic network showed increased FCS in the bilateral inferior parietal lobule, left precuneus, right middle occipital gyrus, and left pulvinar. The FCS in the sensory-thalamic network did not differ between groups. The temporal-thalamic network showed increased FCS in the bilateral middle temporal gyrus and left pulvinar. Comparison of voxelwise functional connectivity between groups. The left column shows cortical lobes and corresponding thalamic subregions obtained by using the winner-take-all approach. The right column shows the between-group difference in FCS. Abnormal voxels are labeled by warm colors and rendered on cortical lobe and thalamic subregions (green). The color scale represents t values by using 2-sample t tests (P < .05, corrected). The z plane coordinates indicate the Montreal Neurological Institute space. No significant correlation was found between the FCS in any abnormal region and disease duration, onset age, or seizure frequency, even when the age at time of the scan was controlled by regression. By measuring brain synchronization by using resting-state fMRI, we characterized corticothalamic networks in patients with IGE. We replicated the 5 corticothalamic networks described previously in both patients and controls, indicating highly organized patterns of coherent activity in the thalamus and cerebral cortex. Most important, voxelwise functional connectivity analysis revealed epicenters within corticothalamic networks in patients. The results suggest that components of the corticothalamic network are not uniformly involved in IGE but that specific epicenters may be crucial to understanding the pathophysiology of this disorder. IGE is regarded as a network disorder1 involving abnormal corticothalamic connectivity.4 Wang et al8 identified abnormal thalamic nuclei in a group of patients with IGE by morphologic analysis, which provided the foundation for seed-based functional connectivity analysis. This revealed decreased connectivity between the medial dorsal nucleus and bilateral orbital frontal cortices, caudate nucleus, putamen, and amygdala. However, another study found a different pattern of connectivity by using a similar analytic strategy.21 This inconsistency is at least partly due to the different locations of seed regions in these studies. To avoid the bias of a predefined seed region in the present study, we performed a voxelwise functional connectivity analysis (expressed as FCS) between the thalamus and cortex.19 More important, the analysis was not restricted to any single corticothalamic network but considered each one independently. Brain regions with high FCS are network hubs that facilitate the integration and propagation of neural processing.19 Increased FCS in patients with IGE is consistent with a high excitatory state or neuronal synchronization22 and suggests that certain brain regions may be responsible for rapidly spreading the generalized spike-waves to all areas. Our results provide additional evidence for abnormalities in this network at the functional level. Because the posterior part of the middle temporal gyrus has been suggested as a semantic hub,34 our findings help explain abnormal semantic processing observed in many patients with IGE. In addition to corticothalamic involvement in the pathophysiology of IGE, increasing evidence underscores the importance of the striatal system.7,8,30 The striatum exerts an inhibitory effect on motor systems,35 and its interaction with the motor and premotor cortices enables the smooth execution of voluntary movements.36 Decreased control over the highly excitable network may also underlie the behavioral symptoms of seizures such as myoclonic jerks. There were several limitations to this study. First, simultaneous electroencephalograms were not acquired to exclude fMRI data with GSWDs; thus, we did not know whether the abnormalities in corticothalamic networks were caused by epileptic discharges. In addition, the mono-/polytherapy undertaken by some patients may have confounded the results. Furthermore, epileptic activity is dynamic, and it is therefore difficult to determine its origin by using a static method. Finally, cognitive data and the socioeconomic status of patients and controls were not taken into account; however, it is unlikely that these factors contributed to the between-group differences because most of the participants were from middle-class families. Key regions within corticothalamic networks were identified with abnormal FCS in patients with IGE through a resting-state functional connectivity analysis. The identification of these epicenters (the SMA, premotor cortex, pulvinar, ventrolateral nucleus, and default mode network–pulvinar network) provides support for the corticothalamic network theory of IGE pathophysiology. G.-J. Ji and Z. Zhang contributed equally to the article. Disclosures: Gong-Jun Ji, Zhiqiang Zhang, Qing Jiao, Yu-Feng Zang, Wei Liao—RELATED: Grants: National Natural Science Foundation of China. This research was supported by the Natural Science Foundation of China (grants 81401400, Gong-Jun Ji; 81401402, Qiang Xu; 81201155, 81471653, Wei Liao; 81301198, Zhengge Wang; 81171328, Qing Jiao; 81201078, Fang Yang; 81271553, 81422022, Zhiqiang Zhang; 81020108022, 31471084, Yu-Feng Zang), China Postdoctoral Science Foundation (grant 2013M532229, Wei Liao), and Qian Jiang Distinguished Professor program (Yu-Feng Zang). Accepted after revision January 17, 2015.